Black Friday, one of the biggest shopping sales of the year, is coming up on 23 November, while the online after-party Cyber Monday falls on 26 November – but amid the sales frenzy, it’s easy to get carried away. Whether you’re planning to hit the shops or head online to try to save on presents and pricey items such as a fridge or TV, use our tips to make sure you’re getting the best deal and shopping safely. Making a list of the items you want to buy and setting a budget can help you avoid making rash decisions or overspending on things you don’t need. Doing your research beforehand can help you figure out what brands or products are on your list. You can also sign up for alerts from retailers or make a plan of the stores you want to visit to help focus your energy on the day. Some retailers such as Amazon, Argos and Currys have kicked off their Black Friday sales early this year. Deals on big-ticket items like 4K HD TVs, fridge freezers, headphones and laptops can already be found online and in stores. So, you could avoid the mayhem and lower the risk of missing out by starting your hunt early. Don’t just jump on the first deal you spot. Make sure you shop around before making a purchase and check whether it’s actually a bargain. You can use websites like PriceSpy to easily compare the cost of items at hundreds of retailers. The website also allows you to see the price history of the item to see if it’s actually a good time to buy it or if it has been cheaper at another time of year. Camel, Camel, Camel is another good website to use in your research. It can show you the price history for products sold on Amazon to see if the retailer’s Black Friday deals are actually a discount or if it has offered a lower price in the past. Some retailers such as Amazon and Asos allow you to create and save a wishlist of items you want, while other retailers may save what you place in your basket. By doing this, you can easily see when the price drops on items you really want, which can help you avoid getting distracted by the flood of deals on the day. It could also help you beat others in the race for sought-after items. 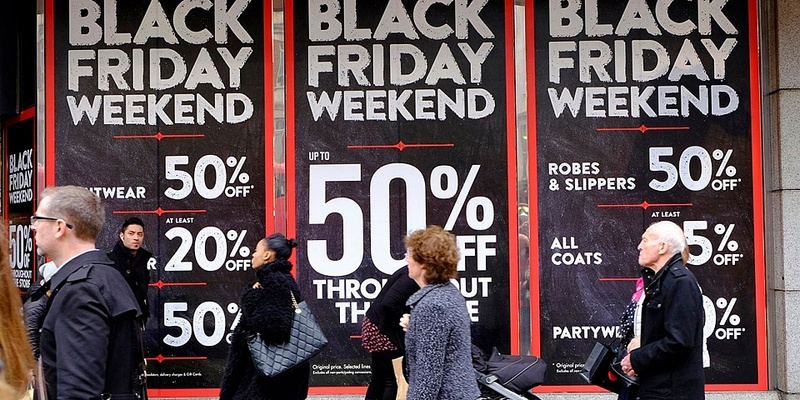 Retailers such as Currys, Halfords and John Lewis offer to price-match big rival retailers, even over big sales periods like Black Friday and Cyber Monday. This means if you can find a cheaper price elsewhere, they’ll beat it. This will usually apply primarily to other high-street rivals and tends to exclude online competitors like Amazon. So make sure you double check if these well-known retailers can beat the offer you found. If you’re shopping online, ensure you factor in other costs that might be added at the checkout, like the cost of delivery. Look for ways to beat delivery costs, like opting to pick up from a collection point or using retailers that will let you order online and collect from a store. As well as the price, it’s worth comparing the extras you get when purchasing an item with one retailer over another. Sometimes retailers will throw in extras like a free subscription to a music streaming service or free delivery, which could make them the better option. Once you’ve found a great deal, you should check if you can make it even better. You might have loyalty points that could get you further discounts or you may be able to find a discount code that could save you even more. Whether you are shopping in-store or online, you can find codes to use on websites like Vouchercodes, MyVoucherCodes or HotUKdeals. You can save even more on your Black Friday and Cyber Monday purchases online by using a cashback website like Topcashback or Quidco. These websites have a partnership with hundreds of retailers like Topshop, Argos and Currys that promise a slice of what you spend back as long as you shop using a tracked link. Check the returns policy of all your Black Friday purchases to ensure you can return the item if you regret buying it. You can only return non-faulty goods for an exchange or refund if the retailer has a returns policy – but shops don’t have to offer one. If what you buy is faulty, you have more rights. You have 30 days to return it and get your money back. It’s a good idea to use a credit card when shopping, as this offers protection for goods you buy that cost over £100 should something go wrong. When buying expensive items such as a TV or washing machine, it’s a good idea to check the reviews. It’s no use getting a bargain if the product’s no good. Unfortunately, fake reviews are increasingly distorting the picture online. In a recent investigation, we found evidence of reviewers being paid for positive reviews. If you want a genuine review, you can use Which? to see our unbiased verdict on thousands of products before you make a purchase. When you’re on the go, you can use the Which? reviews app on Android and iOS devices to quickly look up reviews for over 9,000 products. Scammers are likely to be gearing up for Black Friday and Cyber Monday too, so make sure you’re cautious when shopping online around this period. Watch out for phishing emails offering deals that are too good to be true and dodgy websites with unbelievable prices on big ticket items like TVs, mobile phones and games consoles.